Technological advances and enhanced treatments over the past 40 years have led to major improvements in blood-glucose control for people with type 1 diabetes (T1D). More sophisticated tools, such as systems to automate some insulin delivery or glucose responsive insulin, could help to improve blood-glucose control. To this end, JDRF continues to lead in the support of technological advances and research initiatives to better treat T1D. These new technologies require new metrics for evaluating performance and outcomes. Hemoglobin A1c (HbA1c or A1c), a test that measures a person’s blood-glucose levels over the past several months, is a key metric, or analytical measurement, used today in T1D management. But since it reflects an average blood-glucose level over the span of 120 days, it is not a good marker for T1D control on a day-to-day basis; the occurrence and frequency of dangerous blood-glucose highs and lows are not represented in the A1c. Experts argue that standardization of metrics to measure the success of a person’s T1D control (minimizing high and low blood-sugar exposure) is important, but A1c should not be the sole measure of control. Since the discovery of insulin in 1921, the trajectory of advances in the treatment of diabetes was flat through to the 1970s, when a pivot occurred. 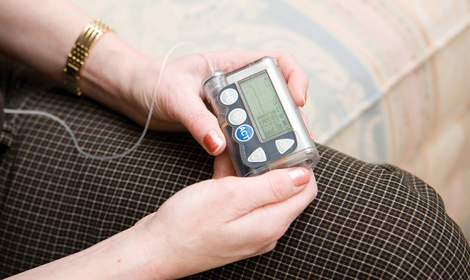 In the 1980s, widespread home blood-glucose monitoring became a reality, insulin pump therapy was commercialized, recombinant human insulin became the standard of care. Importantly, these advances saw a major improvement in glucose control and appreciation of the role of hyperglycemia in the development of diabetes complications. More recently, significant new options have been developed to better treat diabetes—continuous glucose monitors, novel insulin analogues, incretins, and many other therapies have added to our treatment armamentarium. Surprisingly, these more recent advances have not led to similar improvements in the HbA1c levels across the population. Instead, today we sit on an “A1c plateau” (1, 2). Bergenstal et al. address what may be the key element of this problem. Although we have seen the introduction of many new treatments, the diabetes ecosystem is not equipped to empower the provider or the patient to maximize the utility of these therapies. It is clear that we have a breakdown between therapeutic efficacy and effectiveness. A ripe place to start to address this problem is through standardization of metrics for the most important marker of diabetes management—glucose levels. Since the landmark DCCT study, the HbA1c has been the gold standard metric for diabetes control (3). There is obvious justification for this. The DCCT/EDIC and UKPDS conclusively demonstrated the correlation between HbA1c levels and the development of both microvascular and macrovascular diabetes complications (4-8). HbA1c measures a physiologic process by which the hemoglobin molecule is glycated, which is a surrogate for glycation of other proteins in the body and a driver of diabetes complications (9). Therefore, the HbA1c represents a measurable link between glucose levels and the factors driving complications development. While the HbA1c will likely remain a key metric and measurement in diabetes management, it is not however a good marker for diabetes control on a day-to-day basis, nor for providing insight into strategies to improve glycemic control. HbA1c reflects the glycation of hemoglobin over the lifespan of erythrocytes—approximately 120 days. This is generally represented or considered as reflecting a mean blood glucose over this period of time. A mean speed of 55 mph over the past three months of commuting will never reflect times when a vehicle is racing at 100 mph and far in excess of the speed limit or is slowed to 10 mph in traffic congestion. Similarly, the clinician receives only the most basic of information from the HbA1c measurement and masks the occurrence and frequency of dangerous highs and lows. We must agree upon the other metrics and standardize them so that information is provided to patients and healthcare providers to truly realize these goals. Bergenstal et al. have made an important step to do just this. The challenge of defining and prioritizing key diabetes glucose-control metrics was addressed in a workshop with key thought leaders in the field of diabetes, both public and private stakeholders, regulators, and patient representatives. The transition to “big data” is happening in all walks of life and diabetes is no exception, affording a tremendous opportunity to provide data-driven recommendations to patients. Following adoption of a consensus on metrics, tools can and will be developed that present this immense amount of data in ways that can be easily visualized, interpreted, and acted upon. Bergenstal et al. describe one such tool, the Ambulatory Glucose Profile (AGP), that provides a concise and targeted summary to the patient and provider. The group identified four key metrics that provide much more valuable information in guiding diabetes treatment strategies: time in range (the amount of time a person’s blood glucose is within a healthy range), glycemic variability (exposure to hyperglycemia and hypoglycemia), glycemic exposure (the mean and median of glucose values), and assigned values for blood-glucose ranges signaling hyper- and hypoglycemia. Once these metrics are agreed upon, tools such as the AGP will provide diabetes clinicians a significantly improved and practical means to guide their patients in targeted strategies to improve diabetes management and glycemic control. The profile presents a modal day view of the data that allows for patterns to be identified quickly and simply, which will allow treatment strategies to be developed during an office visit. However, we are still not close to achieving our goal of minimizing hyperglycemic and hypoglycemic exposure. The recently published T1D Exchange data demonstrating the elevated A1c levels, severe hypoglycemic events, and overall poor control in many people with diabetes should be a call to action for the diabetes community (10). We will rapidly move to more advanced tools—soon to systems that automate some insulin delivery (11, 12). Without consensus within the community on the metrics for success, it will prove difficult to optimize and compare new technologies, and their optimal adoption, use, and effectiveness will be blunted, which is an unacceptable outcome. In addition, a major unaddressed area and a serious unmet medical need is the extended period of “dormant or silent” diabetes—both types 1 and 2—where HbA1c offers little value as a diagnostic. The AGP provides salient metrics with the potential to standardize the early detection and treatment of “prediabetes,” thus fostering therapeutic and/or lifestyle interventions that lead to the prevention or delay of onset of overt clinical diabetes. In order to improve standards of care, we will have to rapidly develop and adopt “composite” metrics for both diagnosis and treatment of individuals with diabetes. To best accomplish our goals, we will need to raise the level of collective education and awareness for accelerated adoption and usage of such metrics—across the entire healthcare spectrum—including patients, physicians, regulators, and providers. Bergenstal et al. have provided a critical step in the right direction. It is time to formalize these recommendations and to standardize outcome metrics that will help guide therapeutic development, accelerate regulatory approval, and improve clinical outcomes.